Varicose veins are dilated, tortuous, elongated superficial veins that are usually seen in the legs. Varicose veins, also called varicosities, are seen most often in the legs, although they can be found in other parts of the body. Most often, they appear as lumpy, winding vessels just below the surface of the skin. There are three types of veins, superficial veins that are just beneath the surface of the skin, deep veins that are large blood vessels found deep inside muscles, and perforator veins that connect the superficial veins to the deep veins. The superficial veins are the blood vessels most often affected by varicose veins and are the veins seen by eye when the varicose condition has developed. Inside wall of veins have valves that open and close in response to the blood flow. When the left ventricle of the heart pushes blood out into the aorta, it produces the high pressure pulse of the heartbeat and pushes blood throughout the body. Between heartbeats, there is a period of low blood pressure. During the low pressure period, blood in the veins is affected by gravity and wants to flow downward. The valves in the veins prevent this from happening. 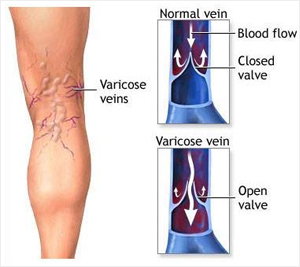 Varicose veins start when one or more valves fail to close. The blood pressure in that section of vein increases, causing additional valves to fail. This allows blood to pool and stretch the veins, further weakening the walls of the veins. The walls of the affected veins lose their elasticity in response to increased blood pressure. As the vessels weaken, more and more valves are unable to close properly. The veins become larger and wider over time and begin to appear as lumpy, winding chains underneath the skin. Varicose veins can develop in the deep veins also. Varicose veins in the superficial veins are called primary varicosities, while varicose veins in the deep veins are called secondary varicosities. The predisposing causes of varicose veins are multiple, and lifestyle and hormonal factors play a role. Some families seem to have a higher incidence of varicose veins, indicating that there may be a genetic component to this disease. Varicose veins are progressive; as one section of the veins weakens, it causes increased pressure on adjacent sections of veins. These sections often develop varicosities. Varicose veins can appear following pregnancy, thrombophlebitis, congenital blood vessel weakness, or obesity, but is not limited to these conditions. Edema of the surrounding tissue, ankles, and calves, is not usually a complication of primary (superficial) varicose veins and, when seen, usually indicates that the deep veins may have varicosities or clots. Varicose veins are a common problem; approximately 25% of the adult population in the world has varicose veins. Women have a much higher incidence of this disease than men. The symptoms can include aching, pain, itchiness, or burning sensations, especially when standing. In some cases, with chronically bad veins, there may be a brownish discoloration of the skin or ulcers (open sores) near the ankles. A condition that is frequently associated with varicose veins is spider-burst veins. Spider-burst veins are very small veins that are enlarged. They may be caused by back-pressure from varicose veins, but can be caused by other factors. They are frequently associated with pregnancy and there may be hormonal factors associated with their development. They are primarily of cosmetic concern and do not present any medical concerns. Varicose veins can usually be seen. In cases where varicose veins are suspected, but cannot be seen, a physician may frequently detect them by palpation (pressing with the fingers). Doppler ultrasound tests can detect varicose veins in the deep and perforator veins and rule out blood clots in the deep veins. As per Modern Medicine there is no cure for varicose veins. Treatment falls into two classes; relief of symptoms and removal of the affected veins. Symptom relief includes such measures as wearing support stockings, which compress the veins and hold them in place. This keeps the veins from stretching and limits pain. Other measures are sitting down, using a footstool when sitting, avoiding standing for long periods of time, and raising the legs whenever possible. These measures work by reducing the blood pressure in leg veins. Prolonged standing allows the blood to collect under high pressure in the varicose veins. However, you can’t remove or shut all the veins in the legs because it will affect the blood circulation. We, Chavarcode Ayurveda Physicians offer you our proprietary blend of Ayurvedic medicine which is time tested for more than a century for curing / reversing the varicose vein. Our proprietary research blend is approved by the AUS Drug Controller & Licensing Authority of India. Who are we ?- Chavarcode Ayurveda Vaidya Family is one of the most renowned ones for its great tradition in India’s ancient and holistic system of treatment: Ayurveda. Many veterans, both in Ayurvedic Medicine and Modern Medicine, who had made rich contributions to the world of medicine, had taken blessed birth in the Chavarcode Family. The family proudly and carefully preserves very valuable and age old manuscripts in Ayurveda, which are inherited from their sagely predecessors. The Chavarcode Physicians were and are sincerely engaged in the research for the treatment of many chronic and incurable diseases. The secret and proprietary medicines formulated and prepared by the Chavarcode Vaidya Family have been found to be of proved efficacy, that the patients, who have been under frustration after having had the modern methods of treatments, have gained absolute solace. Varicose Veins / Spider Veins – VASKO , VEINISH, VEINTONATE , POMEGRANATE EXTRACT and GRAPE SEED EXTRACT. Our proprietary blend of Ayurvedic Medicine VASKO and VEINISH reverses the Venous and arterial endothelial fatty deposits by dissolving and the damaged valves in veins are repaired to regain the tensile strength. Eventually, Fresh collagen fibers are laid down parallel to the old ones and new connective tissue is formed in the valves and a healthy architecture is restored. The new endothelium grown will contribute the strength enough to have sufficient tensile strength of the valves holding venous blood against the gravity. The formulas also dissolve fatty deposits in the endothelium of the arteries. 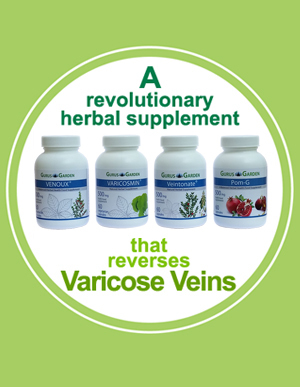 The same way in lower limb arterial narrowing (Burger’s Disease) that ends in gangrene is also reversed by administrating the Ayurvedic supplement VASKO, VEINISH, VEINTONATE, POMEGRANATE EXTRACT and GRAPE SEED EXTRACT. VASKO, VEINISH and VEINTONATE is a non-invasive and safer way compared to the surgical stripping off the varicose vein treatment or modern treatment of intravenous laser therapy. VASKO, VEINISH and VEINTONATE will also help prevent and reverse other problems at the same time. VEINISH also improves the blood perfusion to the brain as it regains the healthy endothelium of vessels to increase its nitric oxide output. This paves the way to increase neuronal metabolism and balanced neurotransmitter state. VEINISH helps to improvise the skin health by stimulating new Glycosaminoglycans and collagen in the layers. And also stimulates immunity with augmented blood perfusion to the skin layers. This effect helps reversing chronic eczema and scleroderma. Moreover, it helps for wound healing with good quality scar formation in the varicose ulcer and eczematous ulcers. POMEGRANATE EXTRACT (95% Ellagic acid and 45% Polyphenols 500 mg capsules) The pomegranate (Punica granatum) has long been recognized as a fruit with many health benefits. Pomegranate tops all other conventional fruits, including blueberry and strawberry, in its ORAC (Oxygen Radical Absorbance Capacity) value, ranking pomegranate as one of the most powerful antioxidant fruits. Antioxidant: One of the ways in which blood lipids become heart disease-promoting (atherogenic) is through oxidation. LDL, for instance, may be technically ‘elevated’ but harmless as long as it does not readily oxidize. Pomegranate has been found to reduce the oxidative stress in the blood, as measured by serum paraoxonase levels. One study in mice found this decrease in oxidative stress was associated with 44% reduction in the size of atherosclerotic lesions. Grape seed extract – Red or purple grapes are considered the healthiest varieties of the fruit, with seeds from these grapes containing high levels of vitamin E, flavonoids and linoleic acid. Grapes seed extract contain the potent antioxidant compounds known as oligomeric proanthocyanidin complexes or OPCs, is a bioflavonoids , which may reduce leakage in veins and swelling in the legs at dose of 720 milligrams of grape seed extract per day. Several studies suggest they may reduce leakage in the valves in the veins and swelling in the legs. Grape seed extract helps symptoms of chronic venous insufficiency, a condition associated with varicose veins. Grapes have been used in folk medicine since the time of the ancient Greeks to treat a wide variety of health problems from bleeding and inflammation to cancer and smallpox. Clinical research is finding grapes and grape seed extract contain potent antioxidant and anti-inflammatory properties that may verify some claims for the fruit’s ability to promote healthy blood vessels and treat varicose veins. A double-blind study conducted in France in 1981 on 50 patients with varicose veins found that 150 milligrams daily of a commercial grape seed extract worked more quickly and its effects lasted longer than the prescription drug diosmin in reducing the pain, burning, tingling and swelling of varicose veins. A separate French study of the same commercial grape seed extract found that grape seed OPCs at a dose of 100 mg three times per day significantly improved heaviness, swelling and leg discomfort from chronic venous insufficiency, a similar condition to varicose veins. Over a period of one month, 75 percent of the treated patients improved substantially. Research published in “Minerva Cardioangiolica” in 1999 showed that grape OPCs caused itching and pain to disappear in leg venous insufficiency in 80 percent and 53 percent of patients studied, respectively. 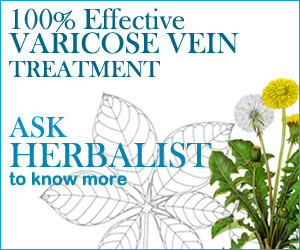 Dosage: We recommend 3 months to 6 months medication for reversing the varicose veins. The effect may vary among users. Side effects: – VASKO , VEINISH, VEINTONATE, GRAPE SEED EXTRACT, POMEGRANATE EXTRACT are 100% natural herbal extract and time tested by Chavarcode Ayurveda Physicians for more than one century and there are no known side effects noted. Pingback: Tips on how to prevent varicose veins.